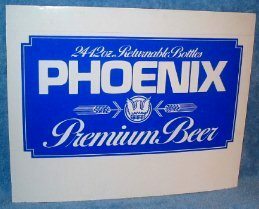 Phoenix Premium Beer; 14 x 11 inch, cardboard point-of-sale sign. This was made without an easel stand. Early 70’s vintage. Great shape. Educated guess on the brewery that made this sign.